Our cities sprout fruits along cycling paths and highways, where hungry travelers have cast away their apples, pears, plumbs, etc. 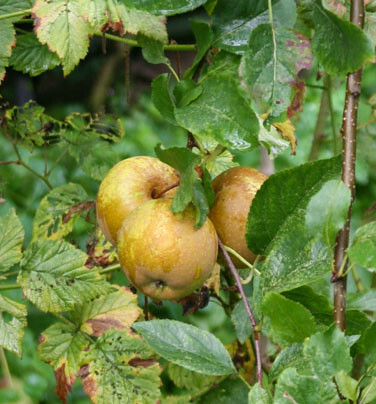 Two years ago, on our first guerrilla grafting expedition, we took some branches from a particularly vigorous wild apple tree (seedling) near Sloterdijk station, and grafted them onto a domesticated tree in the FoAM Amsterdam garden. This year some seven quite extraordinary-looking apples grew on the branch. They are crisp, round and have skin like a dinosaur – extremely rough with grey and minty shades of green. Ruwe Sloterdijk on the tree. Two weeks ago they finally seemed ready for the much anticipated taste-test! We were blown away. The rough exterior of the apples covers an amazingly rich taste, with hints of cinnamon and juniper. In fact these are some of the best tasting apples we've ever eaten! This remarkable fruit deserves to be grown as an independent variety and receive a name. For the world's first guerrilla-grafted variety of apple, we considered naming it DNA: De Nieuwe Appel (The New Apple), but settled on Ruwe Sloterdijk (Ruwe Gulden Sloterdijk in full) or Rough (Golden) Sloterdijk in honor of its place of discovery, and "Golden" because we think it may be related to the Golden Delicious.